Only one week left to vote in the Labor Day 500 and I don't see a ballot from Kent or Frannie Kotal yet. I DO have votes from England, New Zealand and even the Czech Republic, so the list has some unusual things on it. Did I tell you how much I appreciate your alerting me to this ("COME SOFTLY TO ME" featured in "THE GREEN LANTERN), along with emails of congratulations from many others? PS: "Come Softly To Me" is also featured on the CD, GRETCHEN'S SWEET SIXTEEN (SUITE 16), a Billboard Critics' Pick for 10 Best Albums of the Year! (Hear Sound Clips at www. GoldCupMusic.com) - Thanks again! Congratulations on an excellent blog! I work for a live, local radio station that does play Doris Day along with a wide variety of other artists from almost every genre and time period. I only get behind the mic when someone else is sick or on vacation and that will happen this Wednesday and Thursday from Noon to 6 pm. Because I'm a mom and nagging is my job, I'm just putting in a plea to you to rerun your fabulous series on Bobby Darin. I am sending a follow-up to your post of December 11, 2009 (some very unfinished business). I wanted to note to someone beside my wife that the Heaven Sent jingle has morphed into Billy Idol’s White Wedding. Did he listen to WLS in the 60s too? Abbey Road Studio turns 80. Here's a link to the "1950's Radio In Color" review in today's newspaper. >>>When I got up for my nightly 3 AM pee, I started making lists in my mind so I thought I'd share them with you. Perhaps others would like to add their own short lists or comments. and most certainly the great James Brown, Ray Charles and Stevie Wonder -- you simply can't confine them to the r&b genre -- they crossed to rock on numerous occasions. There are a number of others, but it's well after 3 AM in the morning here -- and I've not been to bed, so how can I get up and 'pee,' Steve? :) However, I was pleased to see that you had included Jay Black and Johnny Maestro on the list. Second thought: One of the very first -- in fact, it may have been 'the first,' 'live' events I produced while a senior at El Camino High School (Sacramento, CA) -- was "The Diamonds." Dave Summerville was with 'em then, and is still with 'em now. 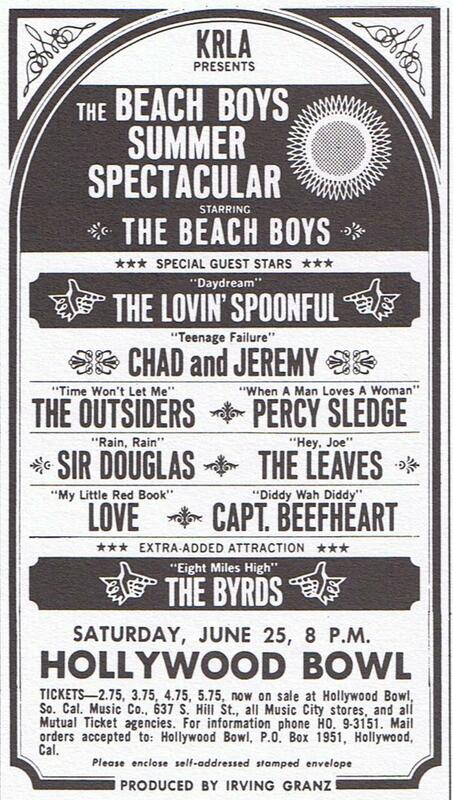 My dear friend, the late Ray Peterson (see list above) worked with Dave a number of times, as he did another great (and often overlooked rocker, Bobby Vee). Finally, a great pix of your daughter and my dear friend and hero, Brian Wilson. Glad you were able to take in his Saint Charles, IL show. Thank you, Fred, for helping us secure the backstage passes to meet Brian and Jeff Foskett before the show. It was definitely a night to remember. >>>You might get to hear some of these listed songs on Topshelf Oldies, which strives to play not only the hits, but the lower charting records, and non-charting songs that sound like they should have been hits. OUCH! Here are the ten worst cover songs ever according to Rolling Stone Magazine. Please note that Britney Spears made the list twice! If you see that guy who writes for The Beat, tell him I'd like to add "Come On Down To My Boat" to his set list! Tell him to do a nice job on and prolong the opening! Wow, Kent - thanks! You da man! "Boat" is a terrific song to do! Falls right in perfectly. And thanks so much to New Colony Rick for an amazing song list! I have got VIP tix to see Johnny Rivers tomorrow night! I can't even tell you how excited I am!! Full report after the concert ... I promise!! Please do! I recently suggested to one of our local area promoters on the list that Johnny Rivers would be a GREAT act to bring to Chicago ... I honestly can't even remember the last time he played here. If you happen to get the chance to meet him after the show, please tell him about Forgotten Hits ... would LOVE to add him to the list of "celebs" who participate! Thanks, Eileen ... have a great time at the show ... and be sure to file a full report! 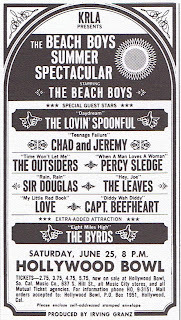 From Ron Smith ... check these 1966 prices. I think I'll go for the expensive seats. I must have played "One Night Stand" about 12 times in a row. What a great song! I have the 45 but it is a poor copy, it is nice to hear a copy as clear as I remember it from my senior year in high school. Magic Lantern's recording of "Shame, Shame" is also in my collection and is nearly as good. The idea of someone donating anything to a Walmart is just ridiculous. If the CDs were still in good shape, he'd try to get something for them. The incident would have made for great television, tho. I really enjoyed yours and Frannie's Elvis stories. My Mom died in 1990 at the ripe old age of 57. She loved Elvis. She asked that we play "My Way" (his version) at her funeral. I never understood why she was so taken with him. Once I told her that I didn't get why she so admired a man that died as a result of his own bad choices. She said he was just a young, naive country boy that was taken advantage of by so many. Everyone wanted a piece of him. Now I understand a little how she felt because I felt incredibly sad when Michael Jackson died. For weeks I couldn't get his songs out of my head. They were playing there all of the time. Michael and my Mom shared the same birth date ... August 29th ... and he died on the same date as my Dad ... June 25th. It's strange how the passing of people you never knew can impact you so much. 1968: "Chicago Mayor Richard Daley ordered local radio stations to not play the Rolling Stones' single "Street Fighting Man" during the National Democratic Convention in anticipation of the rioting that did occur during the convention. The ban gave the song huge publicity, air play and sales." It's very healthy for you to put it out there, Kent. Confronting it, processing it, and moving on past it is so much better than keeping it suppressed. We baby-boomers had parents who had been kids during the great depression and had struggled / fought through WWII, so their view of the world was to work, work and work to achieve the American Dream and rise to a better place than they came from. Many from that Greatest Generation just couldn't imagine a kid having a passion for music, or whatever. Some were more tolerant of their kids' interests than others. Psychologically, they had no understanding that projecting their values so firmly on their kids could hurt so much. They had no idea how damaging their disparaging remarks may have been at times - but this music thing grabbed a lot of us and resonated with something that was there before we were even born - and today we still enjoy it after many changes in our lives. The fact that you put so much into FH is testament to the deep impact this stuff has had on your life, Kent. It won't happen again. Today's youngsters have nothing that comes close. In hindsight, I do remember a few times my dad really surprised me with something SO out of left field it completely blew me away. My two younger brothers were CONSTANTLY getting in trouble, whether it was at school or otherwise. As such, they always seemed to be the ones who got the most attention. Maybe my dad could relate to them better because of his own rough childhood, growing up fatherless in the '40's, I don't know ... but I guess I've always kind of been the "white sheep" of the family ... doing everything by the book ... getting good grades, finishing high school, holding down a good job, raising a family, being responsible, etc, etc, etc. One time my dad and I had been out shopping and I absolutely fell in love with this guitar ... I just HAD to have it. I begged for the money, promising to pay back every penny each week until I had paid for it in full ... but my dad told me that it was simply too much money and we simply couldn't afford it. Several weeks later (must have been my birthday or something), I came home to find this brand new guitar case sitting there waiting for me. The anticipation to open it was killing me ... I just couldn't believe that he had got me that guitar! I opened up the case and it was empty ... what he had gotten me was just the case, to be used with my OLD guitar. I guess the look of shattered disappointment covered my face when he told me, with a tear in his eye ... one of the few times I saw my dad emotional ... "I wish I could have gotten you that guitar ... but we just can't afford it." That is when it finally sunk in ... and I honestly believe it hurt him as much as it hurt me that I couldn't have it. Thanks for all the Brian Wilson content! I enjoyed your story about Brian Wilson's new album due in October, and that picture on the cover is a gas ... the vintage woodie sitting at the beach with the "Micky Mouse" sundown over the sea ... WOW ! ! Brian sure has a sense of humor. It's great to hear all of Ronnie Allen's CLASSIC interviews in one more place! Of course, he is still a regular over at oldiesboard.com! And Ronnie's got a brand new show debuting tonight ... and running EVERY Friday Night before his interview show airs ... here are all the details! I hope that you will pass this on to your readers. I am delighted that starting this Friday (August 19), from 5 to 6 PM Eastern time, I will be hosting a brand-new show on the Oldies You Way Internet station. It's called "Nutty but Nice." As you can probably guess from reading the title and seeing the above image, my show will consist exclusively of novelty and comedy records. I've been a fan and friend of Dr. Demento (AKA Barry Hansen) for close to 40 years. I have enjoyed listening to his shows and been introduced to several thousand records that I had never heard before. Barry still does his show but it's only available on the Internet. These days his shows feature primarily recordings from the 1980s to the present. He has phased out many of the classic "demented" recordings which he used to play a lot that came prior to that decade. His emphasis is almost exclusively on "recent" dementia so-to-speak. My "Nutty But Nice" show will be different from Barry's show in that most of what I play will be recordings from the 1940s through the late 1970s. In short, I will play many records that he would no longer play on his shows. I will on occasion play a "recent" one (1980s and later); for example, on my debut show which airs this Friday, I play "The Man Song" by Sean Morey which came out in 1998. On his shows Barry often plays recordings that fit a specific "theme" and many of those are serious records ("non-Demented" ones, if you will) that are do not fall into the novelty or comedy category. In contrast, my show will feature only novelty and comedy records: there will be no "serious" ones! I will not shy away from most controversial records. "Transfusion" by Nervous Norvus, "They're Coming To Take Me Away" by Napoleon XIV, "Lizzie Borden" by the Chad Mitchell Trio and "Shaving Cream" by Benny Bell (with vocal by Paul Wynn) are ones that I will play, even though many radio stations banned them. In fact, I play "Shaving Cream" on Friday's debut show. Yes, there are certain records that I will not play because of content (if in my judgment a very large group of people might be offended) but I won't go into details here. In the grand scheme of things -- the universe of comedy and novelty records from 1940 through 1979 -- I will allow myself to play almost everything. And I will toss in a more recent one from time to time. My debut show includes a recording by "Old Philosopher" Eddie Lawrence entitled "Old, Old Vienna" which to me is one of the funniest records I have ever heard. Also making the cut are "I'm A Little Busybody" by Jerry Lewis (how does he do it without breathing? ), "Noshville Katz" by the Lovin' Cohens and Stan Freberg's delectable satire of Harry Belafonte's "Banana Boat (Day-O)." Francis Albert Sinatra -- The "Chairman of The Board" -- did a recording with Dagmar which Mitch Miller forced him to do: I understand that he never talked to Mitch after that! Ah yes, "Mama Will Bark" is indeed on this debut show. And so is Dickie Goodman, the singer! Yes, it's the same guy who did dozens of "break-in" records, some with Bill Buchanan but most on his own. In order to play his recording of "See Ya Later, Linda" and keep the show suitable for a "family" audience, I had to bleep out three portions of it. See if you can figure out what I bleeped out! "Linda" is from Dickie's unsuccessful LP called "My Son, The Joke," which was meant to be a raunchy parody of Allan Sherman. Speaking of Allan, I also play a recording by Sandra Gould called "Hello Melvin (This Is Mama)." It was a parody of Allan's "Hello Muddah! Hello Fadduh!". Amazingly Barry Hansen never played Sandra's record on any of his shows. I think it's adorable. You may remember her as "Gladys Kravitz" on "Bewitched from 1966 through 1972. Also on my debut show this Friday at 5 PM Easten time are records by Tom Lehrer, Spike Jones and a lady with the last name of Miller who is not Jody and is not related to Roger. My "Nutty but Nice" shows will include some well-known hit records and many lesser-known ones by artists both familiar and non-familiar to the masses. Expect to hear from the likes of Ray Stevens, the Coasters, Sheb Wooley (and Ben Colder), Weird Al Yankovic, Bob Newhart, the Playmates and Homer and Jethro on future shows. In short there are so many that I can choose from and I will look forward each week to putting together a new show. Your suggestions are indeed welcome: you can write to me at RonnieOldiesGuy@aol.com . I hope you will join me for my debut show this Friday at 5 PM Eastern Time. By the way, immediately following my debut "Nutty but Nice" show will be my "Ronnie Remembers" show at 6 PM Eastern. On Friday I will be playing my interview with the Poni-Tails, the "Born Too Late" girls. I have just added a link to the Forgotten Hits website on the Oldies Paradise website. I will also do everything I can to promote your site to our listeners. I passionately believe that modern radio neglects so many wonderful hits from years gone by. Sadly, the result is that listeners are brainwashed into forgetting those great songs. Oldies Paradise is my tiny bit of a fight-back against the system! Out of interest you may like the attached promo that I wrote and produced for the launch of EKR, the first pan-European satellite rock station. I was Head Of Music on the station and even back then in 1997, I was very passionate about those lost classic songs! You might get to hear some of these listed songs on Topshelf Oldies, which strives to play not only the hits, but the lower charting records, and non-charting songs that sound like they should have been hits. and Helen Reddy's Delta Dawn, a pretty cool tune also. They both charted pretty well early 70's. Now those 45's had some meaning to them. Well, I just thought I would bring these tunes up for anyone out there who had them playing on their turntables. CLICK HERE TO LISTEN TO TSOPSOULRADIO.COM! PHILADELPHIA (Aug. 18, 2011) – Worldwide fans of the legendary “Sound of Philadelphia” now have equal reason to look to the future as well as the past during this year’s 40th anniversary celebration of Philadelphia International Records (PIR), as the label launches globally its online radio station, TSOPSoulRadio.com. TSOPSoulRadio.com delivers instant, round-the-clock access to the enormous catalogue of songs written and produced by KENNETH GAMBLE & LEON HUFF, and their partner, legendary producer, THOM BELL, topped by numerous pop #1 hits, R&B #1 hits, 100 gold and platinum records, Grammy winners and BMI songwriters' awards honorees, through the timeless recordings of Teddy Pendergrass, the O’Jays, Harold Melvin and the Blue Notes, Patti LaBelle, Lou Rawls, the Jacksons, Jerry Butler, the Spinners, the Delfonics, and dozens more. As a direct, digital pipeline to the vaults 24 hours a day, seven days a week, TSOPSoulRadio.com also will be an exclusive resource to an abundance of Gamble & Huff recordings for PIR that have not been available since their original release in the ‘70s on vinyl, cassette and 8-Track. TSOPSoulRadio.com also will be a new go-to portal for previously unreleased material from the vaults, promising to dig deep into the archives for songs, interviews and other recordings from the past 40 years. TSOPSoulRadio.com also will be available to all android and iPhone mobile devices and tablets by way of a new SHOUTcast internet radio app – entirely new ways of bringing this music to your fingertips. Songs Gamble & Huff have written and produced together include the hits "Back Stabbers," "Love Train," "For The Love Of Money," "If You Dont Know Me By Now," "Cowboys to Girls," "Don't Leave Me This Way," "Enjoy Yourself," "I'm Gonna Make You Love Me," "Only the Strong Survive," “Expressway to Your Heart," "Me & Mrs. Jones," and "TSOP" (better known as the "Soul Train" theme). Their songs comprise the most sampled and covered R&B catalogue in the world, by artists such as Jay-Z, Usher, Michael Buble, Mary J. Blige, T.I., 50 Cent, Jaheim and Avant. Gamble, Huff and Bell have recorded and collaborated with a galaxy of stars from the pop, rock, soul and jazz universes, including Michael Jackson and the Jacksons, Elton John, Lou Rawls, Teddy Pendergrass, Patti LaBelle, Harold Melvin and the Blue Notes, Aretha Franklin, Billy Paul, the Spinners, the Stylistics, the Delfonics, Dusty Springfield, Jerry Butler, Wilson Pickett, LaBelle, Archie Bell & the Drells, the Soul Survivors, Laura Nyro, the Trammps, McFadden & Whitehead, Phyllis Hyman and Grover Washington Jr. Beyond playing music and other content from the vaults, programming also will include new interviews with artists and other members of the Philadelphia International Records family. Gamble & Huff will be hosting shows and personally conducting many of the interviews, some of which will be streamed on video from the TSOPSoulRadio.com studios at the TSOP Experience, adjacent to the historic Philadelphia International Records offices on Gamble & Huff Walk, the block of South Broad Street renamed in their honor last year. Additional programming plans include live concerts from the archives; devoting entire days, or day parts, to a particular artist, as well as various specialty shows and customized all-request shows selected by Mr. Gamble, Mr. Huff, members of the extended PIR family, guest DJs and you, the listener. Guest DJs from around the world also are being invited to host. Listeners requests are being accepted by email now at info@tsopsoulradio.com or through Twitter at @tsopsoulradio. To join the TSOPSoulRadio.com Listeners’ Club and gain exclusive content, the ability to enter contests and other membership offers, sign up at www.tsopsoulradio.com. Wow! 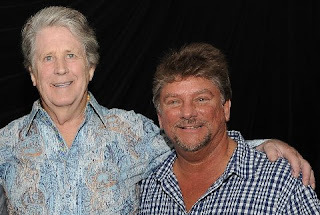 That pic with Brian Wilson is amazing! Loved reading about the show is St. Charles ... good for you! Thanks Kent, and keep the good times coming! Got this one from Ron Smith's Oldies. Brian Wilson is one of the great American composers of the last 100 years. The Southern California native, along with his brothers (Dennis and Carl), a cousin (Mike Love) and friend (Al Jardine), formed the Beach Boys while still in their teens. With Wilson as chief songwriter and arranger, the Beach Boys not only turned out dozens of hits, but changed music forever thanks to Brian’s innovative melodies and harmonies. The band’s Pet Sounds album (1966) is regarded as one of the greatest albums of all time. Wilson continued to make great music after the Beach Boys, with 10 solo albums including his breathtaking Brian Wilson Presents SMiLE, which he began recording in the 1960s and finally completed in 2004 to thunderous critical acclaim and Top 20 chart success (as well as earning a Grammy®). Last year, Wilson made his Disney Pearl debut with Brian Wilson Reimagines Gershwin, which included his versions of great Gershwin tunes as well as two new songs (“The Like In I Love You” and “Nothing But Love”) fashioned from fragments given to Brian by the Gershwin estate. In the Key of Disney – Wilson’s new Disney Pearl collection of songs – brings together hits from animated classics from seven decades of Disney films. The Beach Boys co-founder and musical living legend approached this new collection of timeless classics much like he did 2010’s Brian Wilson Reimagines Gershwin release; by carefully choosing from a vast songbook of recorded history. In addition to producing the album, Wilson wrote all vocal arrangements and co-wrote arrangements for his band with music director Paul Von Mertens. Song selection was a careful process for Wilson, who chose from among every era of Disney films, to appeal to kids and adults of all ages. Drawing on Brian’s genius for layered vocal harmonies and crisp pop arrangements, In the Key of Disney is a must for fans of the Beach Boys and Disney music. For more information on Walt Disney Records’ releases, please visit Disney.com/music, become a fan at Facebook.com/disneymusic or follow us at Twitter.com/disneymusic. For more information on Brian Wilson, please visit www.brianwilson.com. 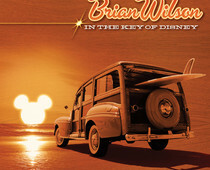 Brian Wilson’s In the Key of Disney arrives in stores and at online retailers Oct. 25, and will be available in CD and digital formats. I would like to comment on two things if I may. Each week in Sunday's FH there seems to be at least one or more comments from readers that instantly reminds me of a record or records that I have not heard on the radio or thought of in years. First, the passing of Billy Grammar ... this past Friday, August 12, Scott Shannon played as his fabulous forgotten 45 of the day, Grammar's GOTTA TRAVEL ON. It was good hearing that again on the radio. What a MONUMENTal record that was for Grammar. I always liked his followup, BONAPARTE'S RETREAT. I was curious about something so this morning I went on the internet to see what recordings Grammar had made through the years. To be honest with you, I was just familiar with the ones that crossed over from country to pop charts. I noticed on the internet he apparently released just one single song in 1969, that being JESUS IS A SOUL MAN. I haven't heard that song or thought of that record in years. In 1969, I believe on WB records, a singer by the name of Lawrence Reynolds had a version which was very big here in OKC. Second, the group the Fifth Estate was mentioned. In 1967 their recording of DING DONG, THE WITCH IS DEAD made it to number one here in OKC. 1967! What a JUBILEE year that was for them. In your reply it happened to me again. You mentioned Johnny Rivers' INTO THE MYSTIC. I think I will get that out tonight or tomorrow and play it. Here's what it reminded me of , Them's MYSTIC EYES on Parrot. By the way, I don't know if you are capable of listening to the True Oldies Channel on Sunday evenings, beginning at 7 PM Central, but Scott Shannon's Sunday night show "Cruisin' America" is a good show. Now it's true that the five hours he's on he plays "oldies" you normally hear during the week, but he has scattered out throughout the show some of those really fabulous forgotten 45's. Now these fabulous forgotten 45's he plays throughout the show are those songs you and I are familiar with, but I can just imagine the normal person out there who catches them going somewhat "bonkers" if he happens to hear one. Some interesting info and tidbits along with a couple of questions and comments. While it maybe a matter of opinion, the first big pop hit rock and roll record was 'Sixty Minute Man' by Billy Ward and the Dominoes (1950 - 51). Bill Brown sang lead and you can hear Clyde McPhatter in the background. Some think its 'Rocket 88' by Ike Turner. Do you rank or assign a date to a record based on when it was released, or was first played, or first charted? In other words, is 'Sixty Minute Man', released December 30, 1950, a song for 1950 or 1951? Do you have any info on the 'Big Band' era ... or my friend Ben(n) Joe Zeppa (Topsy Turvy)? politely explaining them. Hank Ballard's (Annie) records were the last straw. Hi Bob, welcome aboard! We've debated the correct date for tracking a record's peak performance several times before in Forgotten Hits. As far as I'm concerned, it's the year where the record had the most impact. There are so many other things that factor into this. The actual release date ... the date it debuted on the charts ... the date it PEAKED on the charts ... the fact that regional hits sometimes took quite a bit longer to break out nationally ... just WAY too many discrepancies to factor into the equation ... so I have always gone by the date when the record had its greatest impact and success. The example I most often cite is "I'm A Believer" by The Monkees. Joel Whitburn's book shows it premiering on The Billboard Hot 100 Chart on December 10, 1966. On December 31st, it reached #1 ... where it stayed for the next seven weeks. Now Whitburn's books have always listed the record in the year that it peaked ... so TECHNICALLY "I'm A Believer" peaked in 1966 ... for all of one day!!! (Even if you consider the fact that Billboard's charts often reflected "the week ending" date, that means it spent ONE of its seven weeks on top of the chart in 1966 ... the OTHER six weeks were all 1967.) As such, I have always believed (yes, I'm A Believer) that "I'm A Believer" should rank as one of the biggest hits of 1967 ... and NOT as THE biggest hit of 1966, where NO other record managed to accomplish the feat of seven weeks at #1 ... because technically, neither did this one. However, since Joel Whitburn's books are considered the music bible ... and because HE lists "I'm A Believer" as the biggest record of 1966, this is the way history has been rewritten ever since. You'll now find this statistic quoted virtually everywhere ... but I would argue that logically it just doesn't make any sense. Good choice for "Today's Forgotten Hit": TOOT TOOT by Rockin' Sydney ... I recorded that song onto one of my CD-Rs off a 45-RPM copy (on the EPIC label, if I'm not mistaken) a few years back ... and, yes, it DID get a lot of attention at the time (1985) ... pretty catchy for a "macho anthem". Great idea you had about a non-charting song as a FH. Wait a minute! Is that an oxymoron? Something that is true and false at the same time? If you can think of any others, add them to your list if you want. never even charted on the national charts. I remember the title of the song (My Toot Toot) but can't remember where I heard it here in OKC. I don't know about you and Chicago, but our top 40 radio station weekly survey began in August of 1958 and ended in up through the year 1979. So maybe for a time it was played here in OKC but I really don't know. I don't have a copy of either version. You would have loved our Local Hits Series a few years back where we went around the country and spot-lighted songs that were HUGE, Top Ten Regional Hits ... yet never even made a dent on the national charts. (Turned up some really good tunes along the way, too!) I'd love to do another one of these if folks on the list want to participate. We'll just need background information on the songs and artists (and most likely a copy of the tune, too, so that we can feature it on the site) ... as well as any other chart information you can share. It's always cool to see what other folks were listening to ... we've run all kinds of Top 40 surveys over the years where you know 90% of the tunes because they charted everywhere ... but we're blown away by that OTHER 10% that often ranked just as high as obscurities! You have done it again as usual. One of the great things about FH is the songs or artists and groups that are mentioned occasionally which triggers my mind or jogs my memory about other songs and or groups and artists. The case in point is Tuesday's FH. I have not thought of singer Rusty Draper in years. He was originally from Tulsa, OK, I believe and made a lot of records for Hg back in the fifties. (a chemist knows what Hg stands for). The song in question, MIDDLE OF THE HOUSE, reminded me that Vaughn Monroe also had a version, which subsequently reminded me of one or two songs that Monroe had that I had not heard in years, one being SOUND OFF, later remade during the rock and roll era by R & B singer Titus Turner. Kind of like a snow ball effect. Keep up the good work. Great choice for Friday's FH. I am probably one of the few people who, when they hear the name Doris Day, think first of her records she made back in the fifties as opposed to those who think of her first as an actress. When I saw yourchoice, I played it and immediately went in and played the Shirelles 1963 remake which I thought of first thing when I saw Doris Days' song. Instead of thinking about retirement, Mick starts a new group. Now he's in two groups instead of one. Where does he get the energy?